"Money makes the world go round" is often quoted from Cabaret, but learning about its history in Australia is free at the ANZ Banking Museum. Located in the heritage listed Gothic Bank building which is still used as a bank today, the entrance to The Banking Museum is a few steps below street level, marked with a sign underneath an impressive gargoyle. The Gothic Bank. Photo credit: Scott Sandars. The Banking Museum, which consists of a single room packed with an overwhelming amount of banking paraphernalia, is enjoyed as a self-guided tour. However, a museum attendant is always around to help sate your curiousity about aspects of the exhibition. Your chronological journey will begin before banking even arrived on Australia's shores, with the first part of the exhibition taking a look at the early Indigenous economy. Next, you encounter a full wall of the history of banking in Australia from the 1780s to 1950s. It is along this wall that you will see antique moneyboxes and currencies. Along the next wall is the history of the ANZ bank itself, with staff uniforms and images of how their bank used to look on display. This wall ends with an interactive screen on which you can view their television ads from years past. Then, you will plunged back into a more general history of banking from the 1960s to contemporary times. It is on this wall that you will encounter what is perhaps the most exciting part of the exhibition: the interactive ATM game. Played with a game card collected on your way in, it gives you the chance to win a moneybox. The future is not left out of the museum, with the last exhibit speculating about how banking will change in the years to come. In the visitor guide - which you borrow for the duration of your visit at no cost - the key theme of the museum is described as being 'financial literacy'. It is with this focus in mind that the museum would be of educational value to youngsters, although the information presented and paraphernalia displayed would appeal to visitors of all ages. Other parts of the Gothic Bank are waiting to be explored for their stunning architecture, with the Banking Hall a must-see for its gold encrusted ceilings. However, you can't both wonder at the architecture and visit the Banking Museum on the same day - while the museum is open weekdays, tours of the Gothic Bank are only given on weekends from 10am to 4pm. 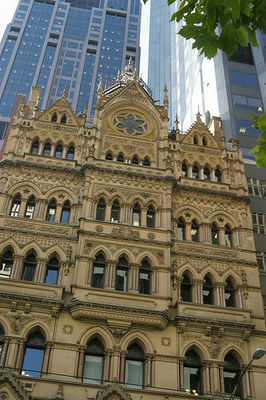 Located on busy Collins Street in the city, the Banking Museum is easy to get to on the 11, 31, 48, 109 or 112 trams. Why? To learn about money without spending any. When: Monday - Friday, 10am - 3pm. Where: 380 Collins Street, Melbourne. Wow at first glance it sounds like such a dull place, but it actually sounds quite interesting! :) I love the types of museums you can find when you look hard.